Do you know how to apply digital makeup? Learn the pro techniques to make your photos really stand out.Nowhere is the phrase “love at first sight” truer than in the field of digital marketing. As soon as an image appears on a page, our eyes go to work examining and dissecting it. In a fraction of a second, your subconscious mind kicks in with an almost instantaneous analysis. Whether it is to catch the eye of a happenstance web surfer or to stand up to the close inspection of a client, the visual media we use for marketing needs to possess a certain degree of professionalism. What is the first image people often see on social media such as Facebook or LinkedIn? The profile, of course! Fortunately, if editing a profile–or anything with a face in it–is what you’re after, Adobe Photoshop features a useful set of tools. They range from simple and automatic, like the spot healing brush, to the more advanced adjustment layers–that can help give your image the crisp, clean, and professional look that will get any inquisitive eye to do a double take. Let’s face it: acne has a lot of enemies in this world. In the physical world, it’s caught fighting on two fronts against good sleeping habits and Proactiv. While, in the digital realm, it cannot escape the wrath of the Spot Healing Brush tool. Having come a long way since its introduction in Photoshop CS2, this feature is one of the fastest and most time-effective ways to eliminate pinpoint imperfections. All you have to do is color over the area you want to replace, be it a birthmark or a zit, and it appears to paint with regular, healthy skin. Behind the scenes, the Spot Healing brush implements a script that samples the environment around the selection you make. Then the script uses what it finds, to digitally generate a fill, to apply to the inside of the selection. Now that you understand what the Spot Healing brush script does, there are a couple of ways to enhance its performance. The most important consideration is to alter only small parts, or “pinpoints” of the image at a time, which is done best with the “Proximity Match” function selected at the top. After all, since the fill is generated entirely by sampling, larger areas will be dominated by unnatural splotches of color and texture obtained from an expanded sample area. 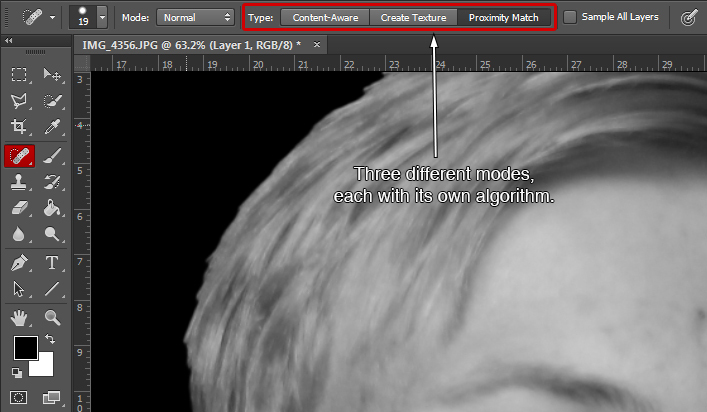 If it is necessary to select larger areas, switch the mode from “Proximity Match” to “Content Aware”. This alters the script, to generate a more consistent field at the expense of the selection edge’s consistency with its surroundings. To further manipulate where the samples are obtained from, you can start your selection outside the area you seek to replace, including more of the clean surfaces you want the tool to focus on. As a result of this bias, that area will be used as the more dominant fill. As is the case with any powerful hero, the Superman of the digital acne removal world has its own Kryptonite–thresholds. Because of the way the Spot Healing Brush samples its surrounding environment, putting it near a high contrast edge, will result in a sampling of content beyond the edge. This content will then get sprinkled into the artificial fill. In our case, filling in the birthmark on the edge of the mustache, results in an unrealistic mix of skin and facial hair acting as the fill. As luck would have it, the Spot Healing Brush has a trusty sidekick, the Clone Stamp tool. The clone stamp works in a much simpler fashion than the Spot Healing Brush and utilizes much less script-based image generation. Hold Alt and click into an area you want to use as your sample. Release the Alt key, and begin coloring over the area you want to substitute. The tool copies the motions of the brush in the area-to-be-replaced within the sample area. Everything around the sample area is used as the fill for the brush in the new area. This tools becomes especially useful for thresholds when combined with the marquee tools, since selecting only the side of the threshold–such as the edge of a face, mustache, mouth, and so on–that you wish to affect and picking a sample point farther away from the edge fixes the skin imperfections with a consistent fill that doesn’t disturb the boundary. Similarly, the Clone Stamp tool also tends to work well for altering larger-than-pinpoint sized areas when the “Flow” of its brush is set to a value below 50. This setting allows for the texture to be replaced by a sample of your choosing while still offering nearly seamless blending to the surrounding environment. The real problem with acne is not only the white heads it produces but also the redness and irritation of the skin that comes with it in a “Buy One Get the Other Free” deal. This means that while we might be able to use the Spot Heal Brush and the Clone Stamp tools to clear away the zits themselves, the telltale redness will remain. The best way to regularize and neutralize the leftover redness is to utilize Photoshop’s Hue and Saturation adjustment layers. From the “Adjustments” window at the right of the traditional Photoshop workspace, click on the Hue and Saturation box. It’s a good idea to select the layer you want to adjust. Overwise, position the adjustment layer above the ones you’re trying to affect. This should happen automatically if you have the right layer selected. Since we want the changes to be implemented to only the red areas, we need to first deselect the rest of the image. Next to the adjustment layer name, you will see a white box–this is photoshop’s code for which parts of the image are affected by the adjustment and which aren’t. Black is 0% affected while white is 100% affected, and anything in between is a partial effect. This changes the white box to black. At this point, we want to start selecting the acne-affected areas. 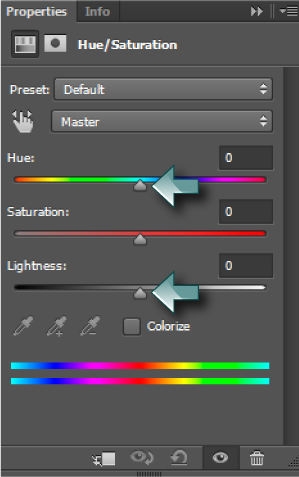 With the newly-colored black box next to the Hue and Saturation layer name still selected, switch your primary color to white and select the brush tool. Try the Swap keyboard shortcut shown above to get white back as the foreground color. Depending on the number of passes made over any given part of the image. With the brush adjusted to your liking, color over the red areas in question. To undo brush marks on the adjustment layer, switch the brush to black and reclaim some of the selection. You can practice changing the values on the sliders to see the effect the adjustment has. Until the adjusted area matches the rest of the skin. 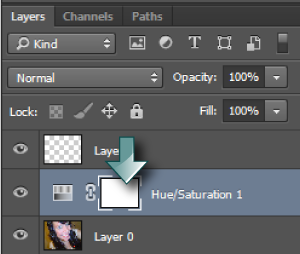 To view the above Hue and Saturation properties window click the layer thumbnail. These changes should be slight and subtle, and if the effects are too noticeable, feel free to lower its opacity until a satisfactory match is achieved. Now that the face is clear of acne, we can focus on a more optional and stylistic process. There are those of us out there that have been blessed with the ability to grow evenly distributed beards dense enough to land them on the cover of GQ. 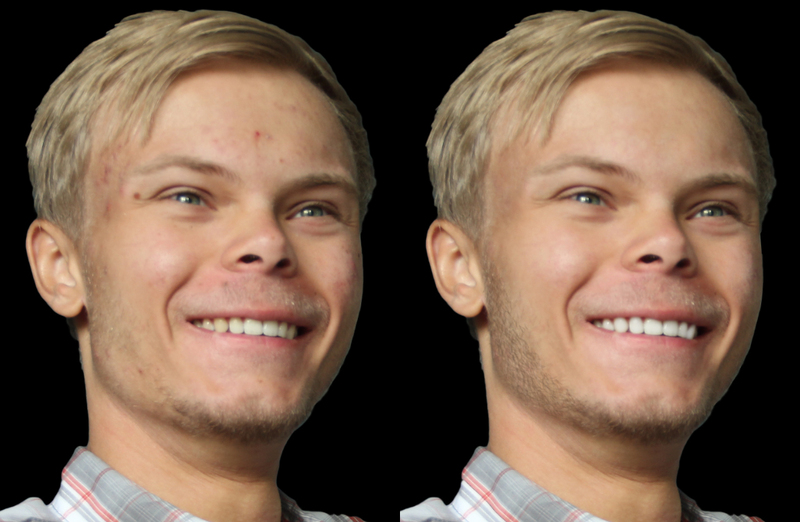 For the rest of us, there is Phlearn’s facial hair brush for Photoshop. It is open source and free to download, and even comes with a complementary Youtube tutorial outlining how the brush is created and customized. For our simpler purposes, we will take the brush as-is and only change a few parameters. To install the new brush, first download Phlearn’s file and extract it. 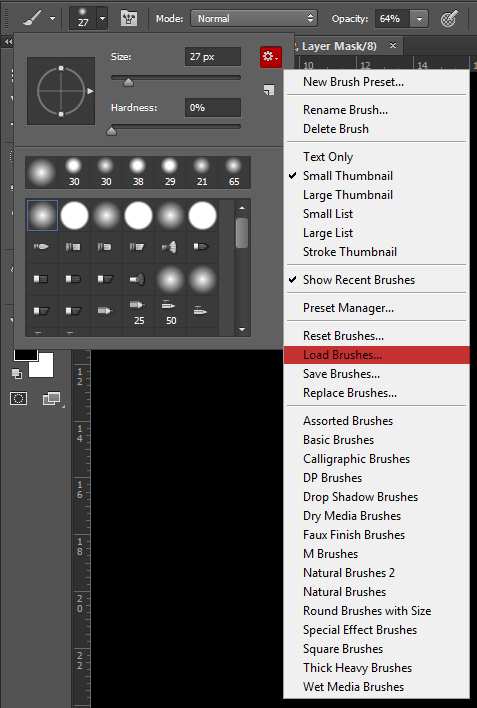 Then, go into Photoshop and, with the Brush tool selected, click on the drop-down arrow next to the brush size and hardness icon at the top left. A familiar window should pop up that contains the aforementioned parameters as well as a number of presets below them; we will instead look towards the top right of this box to find the gear icon and, after clicking that, select “Load Brushes”. After navigating to the folder where Phlearn’s brush is saved and loading it in, you should see it pop up towards the bottom of the previously mentioned presets palette. Select the new facial hair brush, listed in the bottom of the Brush Presents Window. While using this brush you should experiment with the brush size. The way you go about filling in the facial hair is fairly open ended. Yet, it is important to keep several pointers in mind. How does one change the density? 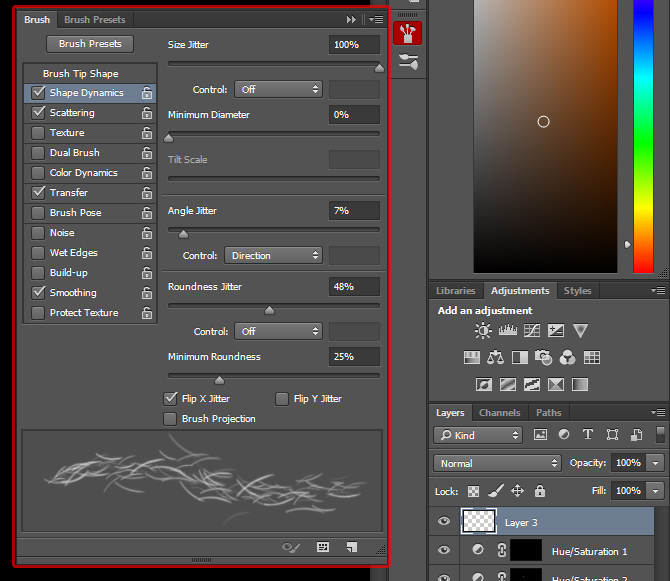 While the brush is selected, at the top right of your workspace click the icon of a cup with brushes sticking out of it. That bring up a window with various categories on the left side–look for the one call Scattering. The brush comes with a default setup that is effective for a large DSLR photograph (around 3500 x 5000 pixels). 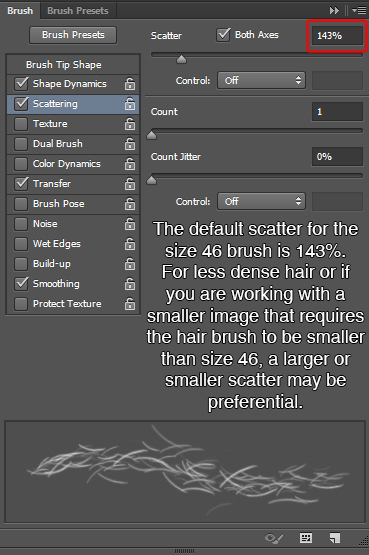 If you’re working with a smaller resolution image, decreasing the brush size will necessitate a proportional reduction for the scattering value. Changing the “Count” value tends to have an inverse effect. This proportionality comes in handy when choosing each hair color’s density. As with any beard, the color of the hair will vary, and some of the hairs will reflect light, making them act like highlights. The lighter being an extreme highlight. With such a setup, the middle color will consequently get the highest density, the darker will be scattered twice as much, and the highlights being the least dense of them all. Keeping the colors on separate layers will allow you to erase hairs that happen to fall out of the beard area. As well as, further regulate density by erasing individual chunks with the eraser tool. Make sure to overlap this digital hair with any facial hair that is already in place to make a seamless transition. When the layers are built up, adjust the Opacity of each to match with the existing condition. Hair that is too bold and prominent will look as unrealistic as hair that is too transparent! The last item on the to-do list depends on the sharpness of the facial hair in the image. 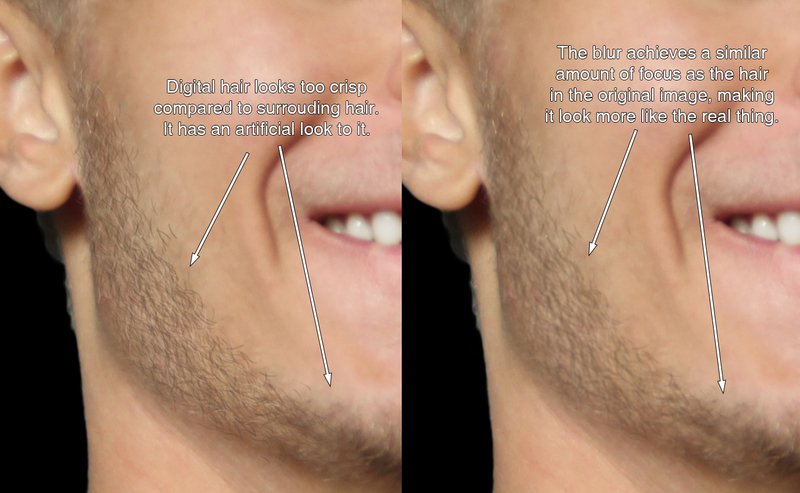 In our case, the hairs are actually blurred slightly compared to other facial features, which causes the digital hair to appear unrealistically sharp. Click the “Filter” tab at the very top of the screen. Or use ALT + T.
Hover over “Blur”. Or hit the B key. Selecting that effect will produce an entirely new preview window with parameters on the right side. We will only be using the “Radius” slider, which is linearly related to how blurry the image is–the higher the value the greater the blur. Depending how out of focus the existing facial hair is, we will need to match the blur of the existing hair to that, which will most likely necessitate a Radius value of 3-7. Once you find the value you like, you can hit OK at the top to apply it. If the change doesn’t live up to your expectations, you can always undo and try again. Take a look at the video below to see how I did it. Here is the result of our digital makeup efforts in Photoshop. You can click to enlarge the image and compare before and after. What do you think? Doesn’t the image on the right look more professional?